NIMBioS postdoctoral fellow Tom Ingersoll is collaborating with fellow bat enthusiasts to understand the cause of and predict the spread of White-Nose Syndrome (WNS) in bat populations. Since first discovered in a cave in upstate New York in 2006, WNS has killed an estimated one million bats in caves and mines in North America. 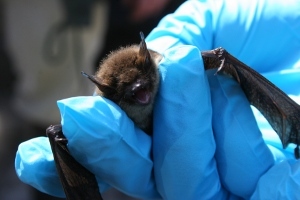 New research predicts regional extinctions of the most common bat species, the little brown bat, within two decades due to WNS. Ingersoll is working on three models for the disease. The first is a theoretical dispersal model based largely on simulation, which will inform data collection and disease containment strategies. The second is a map showing calculated probabilities for future spread to help local managers plan for the inevitable arrival of the disease in their area. The final model is a dynamic occupancy model based on collected data that will be used to investigate the environmental covariates of WNS occurrence. In the following interview, Ingersoll explains his research and how he became interested in the mighty bat. [My] research here is in the very early stage and is part of a broader international collaborative effort. Our general hope is that we may identify some means of influencing the outcomes of the WNS outbreak so that bats remain abundant contributors to ecological communities, but this is more of a management goal than a scientific one. Our contributions to science will be more specific . For example, we hope to develop statistical models for disease surveillance data that account for the difficulty of detecting certain wildlife diseases. These models may then be applied to diseases other than WNS, including zoonotic diseases that spread between humans and other animals. Q: Tell us something about your field of study we may be surprised to know. I do find myself very surprised by the resilience of my colleagues. These are people who love bats and who are finding this love challenged by, what is for many of us, the most daunting catastrophe of our careers. WNS is highly lethal to many bat species, and it spreads at an alarming rate. It would be easy to surrender to hopelessness, thinking that nothing can be done. Yet, I am surprised by the prevailing atmosphere of enthusiasm and optimism exhibited by those who share this challenge with me. If there is anything that can be done, we have hope to find it. Q: Do you have an interesting "personal side" to your research experiences that will increase human interest in your story? I'll tell you about the first bat I ever touched. I was a teenager having the summer of a lifetime. Three of us boys were in Paul Penley's Cave, in Bland County, Virginia: Larry, Kim, and I. We had just gotten old man Penley's permission to enter his property, and it was our first time in the cave. Larry was in front, as was typical, myself in the middle, and Kim bringing up the rear. We were crawling in a long low passage about a meter high and a couple kilometers into the cave, hungry for deeper places. A bat flew up the crawlway from deep in the cave, apparently not expecting obstacles in its familiar path. It managed to dodge Larry, but collided with my chest, landing cruciform on its back in front of my face, as if placed there for my examination. This particular bat was an albino and had pure white fur. His skin was translucent, the whole giving the effect as if he were spun of pink and white glass. I could clearly see the blood pumping through his tiny veins, the awareness of his life making my own heart race. By now Larry had turned around and Kim had caught up, the three of us crouching, looking down in amazement at this sublime little creature. The bat got up, shook its head, then flew away with a small piece of my heart. NIMBioS is a perfect match for both my teaching and research philosophies. Biology and ecology provide meaningful applications for mathematics that contribute to the understanding of nature as well as to the welfare of society. What is very special about the NIMBioS fellowship is the opportunity it provides for interacting and collaborating with NIMBioS Workshop and Working Group attendees. I expect to benefit from many invaluable partnerships this way.